Step 1. Unplug the existing coaxial antenna wire from your own VCR “Antenna In (RF)” interface. Action . Unplug coaxial line no. 2 from your VCR “To TV (RF)” slot. Keep others end of line #2 connected into the television. Step 3. Plug the current coaxial antenna wire to the “In” slot on your own 2-way splitter. Step 4. Plug the loose end of wire number 2 in to the “Out to TV (RF)” port on Converter Box “A”. Step . Plug one end of coaxial line number 3 into one of several “Out” harbors regarding 2-way splitter. Plug one other end into the “Antenna In (RF)” slot on Converter Box “A”. Step . Plug one end of coaxial cable #4 to the other “Out” interface from the 2-way splitter. Plug another end into the “Antenna In (RF)” interface on Converter container “B”. Action 7. connect one end of coaxial cable number 5 to the “Out to television (RF)” interface on Converter container “B”. Plug another end into the “Antenna In (RF)” port on the VCR. Step 8. Using your set of A/V cables, connect one end of cables to the “A/V Out” ports on the VCR. Match the colors associated with the plugs into the colors of this harbors, to make certain that red plugs into purple, white into white, and yellowish into yellowish. Plug one other end for the cables into the “A/V In” port on your TV set in the same manner. Should your television doesn't have a red (Audio R) slot, leave the purple cable unplugged on both stops. Action 9. Plug the energy cords in your Converter containers, VCR and television into energy outlets, and switch them all on. Tune your television to channel 3 or 4 (follow the guidelines inside converter box handbook) to create Converter Package “A”. Using the remote control that came with Converter Box A, follow the on-screen set-up guide to scan for available DTV channels. Step 10. 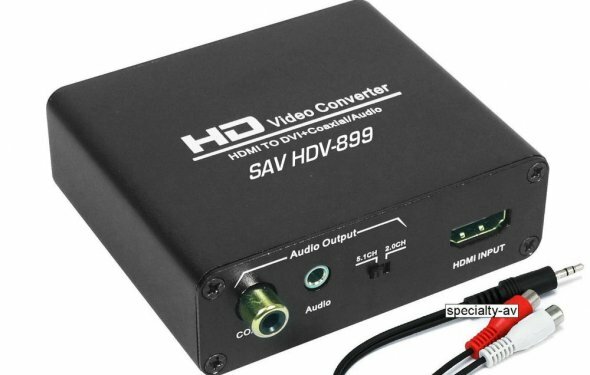 Set your television to “Audio/Video In” and tune your VCR to channel a few (follow the directions in the converter field manual) to set up Converter container “B”. Using the remote that was included with Converter Box “B”, follow the on-screen setup guide to scan for available DTV stations.